There are 1oo1, 1oo2, 2oo2, 2oo3 etc voting logic in the safety instrumented system architecture. The voting logic architecture usually used in the field instrument and or final control elements to reach certain Safety Integrity Level (SIL) or to reach certain cost reduction due to platform shutdown. 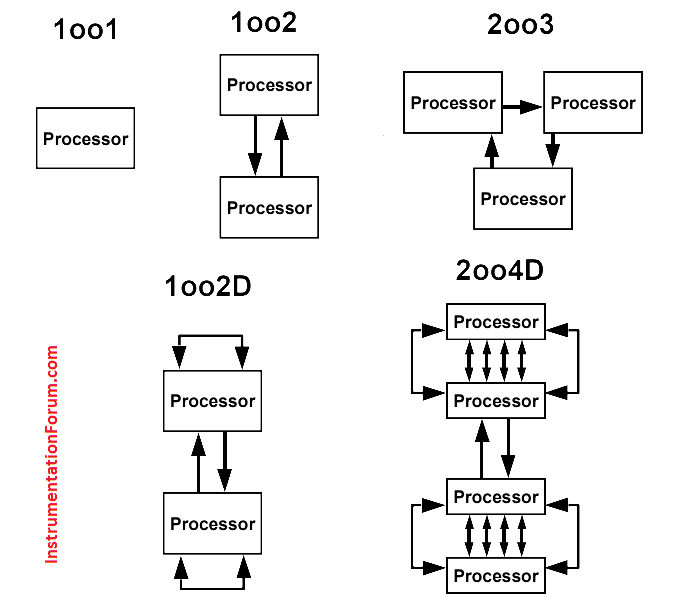 In general when we must use 1oo1, 1oo2, 2oo2, or 2oo3 voting logic architecture? As mentioned above, there are two purposes why certain voting logic architecture were chosen, first is to reach certain SIL and secondly to reach certain cost reduction due to spurious platform shutdown. In order to determine a certain SIL requirement, a risk or process hazard analysis is used to identify all process, safety and environmental hazards, estimate their risks, and decide if that risk is tolerable. Where risk reduction is required an appropriate SIL is assigned. The individual components (sensors, logic solvers, final elements, etc.) that are working together to implement the individual safety loops must comply with the constraints of the required SIL. In essence, this means that all components within that loop must meet a certain Probability of Failure on Demand (PFD), Safe Failure Fraction (SFF) and Hardware Fault Tolerance (HFT) requirement for the intended SIL. Readers are encouraged to see further detail regarding this PFDavg, SFF, and HFT in the IEC 61508 & IEC 61511. As general rule, first of all the SIL requirement for any particular condition or application will be determined using a risk or process analysis. After the SIL was determined then the architecture of the sensor, logic solver, and final control element is studied to investigate which architecture will fulfill the SIL requirement. For example, if the SIL requirement for a high pressure incoming pipe line is SIL 3, then the architecture of the pressure sensor and final element will be investigated. If 1oo1 sensor, 1oo1 logic solver, and 1oo1 shutdown valve can fulfill the SIL 3 requirement, then this architecture is chosen. If not, then any other voting logic architecture is investigated. Let’s say after several investigations the voting logic 1oo2 sensor, 1oo2 logic solver, and 1oo2 shutdown valve can fulfill the requirement of SIL 3, then this voting logic is chosen. If the cost reduction study need to minimize spurious trip due to one of the sensor failed, then may be the sensor voting logic architecture must be upgraded to become 2oo3 architecture. This architecture may be chosen since if one sensor failed, then the overall architecture is still fulfilling SIL 3 requirement with 1oo2 sensor configuration. Thus it doesn’t need to have a platform shutdown when one sensor failed.